The Coal Coast exhibition features documentary photographer Sirkka-Liisa Konttinen work on the East Durham coal coast taken between 1999 and 2002. The study visit was held on the opening day with a talk from the artist who described how she became involved in the project to document the legacy of coal mining on the North East Coast and its communities. She stayed in a caravan a couple of nights a week and spent the whole day on the beach from dawn to night time. The photographs document the effects of coal mining on the coast including the litter and mineral/coal deposits. The pictures are in colour and the composition and focus on colour, whether in landscapes or close-up composition is extremely well done. Does the beauty of the images work with or against the focus on human industrial debris? I was interested in discussing composition with OCA tutor Wendy McMurdo. The artist’s composition varied with some very symmetrical images and some off-centre. I tend towards symmetry in my composition which is something I am trying to get away from but I was interested in Wendy’s take on this as so many artists do use symmetry. Wendy asked which were the most interesting pictures to look at and I had to admit the unsymmetrical ones had the most interest. Although, I do still like symmetry! In the pictures below – Dawdon, evening September 2001. Your eye follows the receding wooden piles and zig-zagging waves to the end of the cliff and rock which is to the left of centre – however, the horizon is pretty much straight across the centre. In Crimdon Dene, the image is much more symmetrical. The image feels more abstract although it is clear what it is. I feel it is still an effective image. Dawdon, evening 11 September 2001. Wooden piles, remains of supports for rail track for wagons tipping pit waste in the sea. © Sirkka-Liisa Konttinen. I was interested in Konttinen’s detailed and poetic captions for her photographs, for example the above picture is captioned: “Hawthorn Hive. Afternoon 24 May 2000. 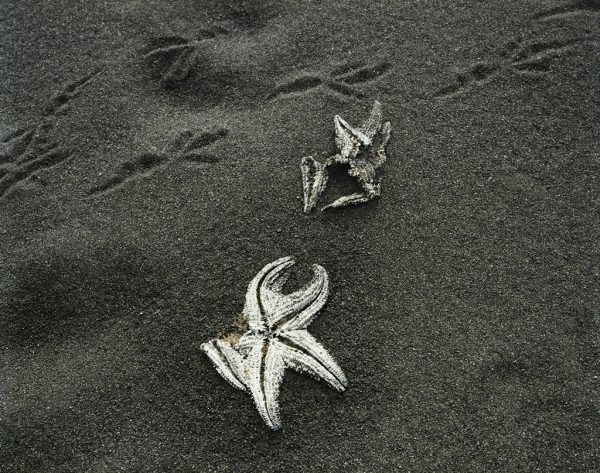 Iron pyrites pounded to sand, bleached shells of starfish: footprints of bird.” I like the way this image seems to be black and white until you notice the tiny patch of yellow/brown on the lower starfish. The Degas to Picasso study visit was an interesting experience. The exhibition itself was based on a single private collection and featured a lot of works on paper. 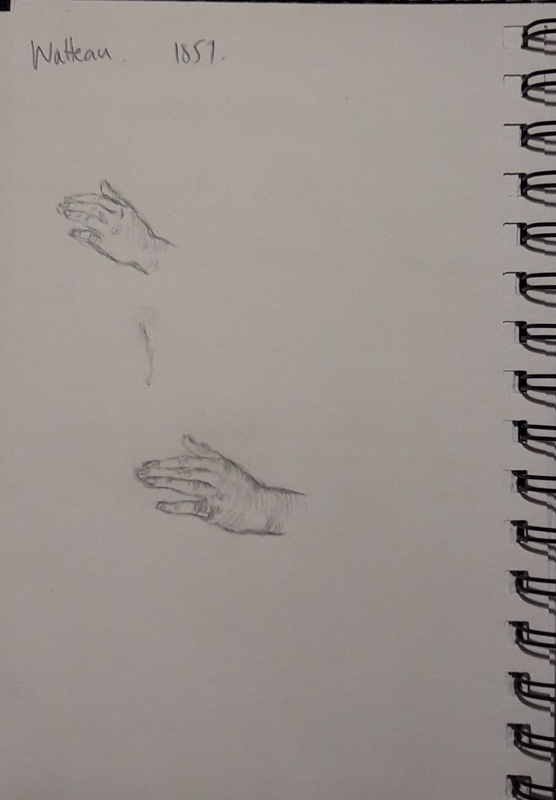 As I am currently on a drawing course this was not necessarily a bad thing and it was fascinating to see how artists such as Degas and Monet used drawing to explore ideas and composition. As it is a private collection, there are no copies of the work online as far as I can see and no photography was allowed in the exhibition. 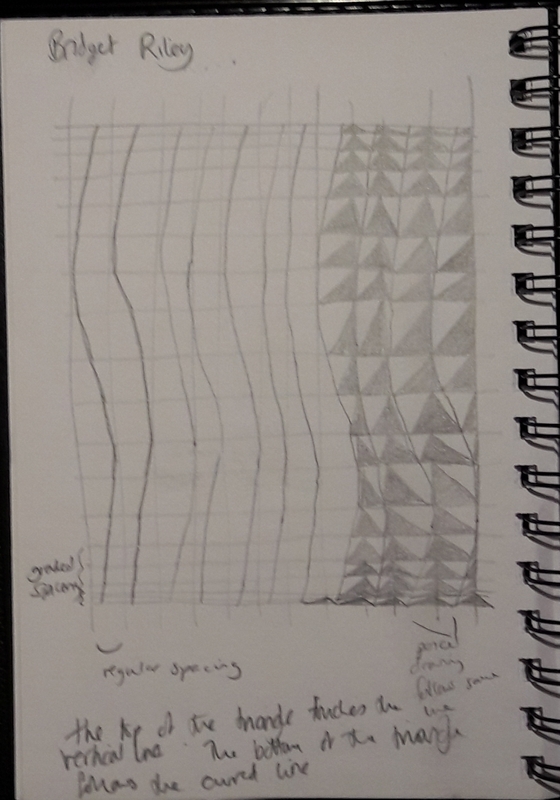 I made some drawings in my learning log some of which I have inserted into this post. Monet did repeated studies of a sailing boat beached on the shore at Saint Adresse. I admired the vigour of the drawing which was in charcoal, with vigorous lines and broad tones. I couldn’t find an example from this series on the internet. Another artist who did many studies of the same image was Degas whose “after the bath” of a woman drying her leg was a beautiful drawing using charcoal, white chalk and pastel on tracing paper. This is featured on the Ashmolean’s exhibition page. The exhibition also showed how Degas repeated images using printing techniques, often removing detail to bring an image down to its essential form. I was drawn to a small Odilon Redon drawing in pastel and graphite on brown wove paper. “Christ on the Cross” 1910. The more I see of Odilon Redon’s work the more I love him, This drawing was vibrant with colour and had a fresh and modern composition. There was a good representation of cubism at the exhibition. I found the cubist pictures quite cold and unemotional (of course Picasso’s Guernica and Weeping Woman are very emotional so it isn’t always the case). While I enjoyed looking at Albert Gleizes works “Still Life” 1911 and “The City and The River” 1913 I was struck by how the techniques of cubism are now redolent of graphic design and company logos with strong colours and black outlines. I preferred Andre Masson’s “A Celebration” 1958. An abstract pastel drawing on orange brown paper Masson used the techniques of automatic drawing to produce and energetic and emotional swirl of colourful marks. Again, as a drawing student I did appreciate the notes on media that the Ashmolean gave us. It brought alive for me the fact that these artists sat with the same materials that we possess – paper, chalk, pastels, pencils, and produced amazing and beautiful things. Robert Rauchenberg at the Tate Modern is an overwhelming blast of artistic ideas. It is astonishing that one person could produce so much work in so many different areas. Did he ever have a crisis of confidence? The exhibition doesn’t tell us. One thing that struck me about the exhibition as a whole was that all the art seemed to be manifestations of Rauchenberg’s personality. “his quest for innovation was fired by a boundless curiosity, the joy of working with what was readily available, an enthusiasm for collaboration and a passion for travel” (exhibition notes). The personality of the artist was an important aspect of the work. I have discovered that virtually all art is much more meaningful experienced in person rather that viewed online or in a book. Rauschenberg is very much an artist of ideas. Was it important to see his work close up? I think it was. There was a physicality about Rauchenberg’s work which I didn’t expect. Looking at his “Combines” – work combining canvas with objects found around his New York neighbourhood – brought home the physicality not only of painting but also of searching for objects and making them into his art. There was a strong emphasis on collaboration in Rauchenberg’s art especially in the area of performance art, dance and engineering. Open Score involved two tennis players with customised rackets. These contained sensors that triggered bonging sounds and turned lights off when the ball hit them. When the venue was completely dark, 500 people performed a series of actions following instructions prepared by Rauschenberg. They were filmed by infra-red cameras and projected on large screens for the audience, who could not see them otherwise. It was good to meet fellow OCA students and discuss their reaction to Rauchenberg’s work. What I take from this exhibition. idea for painting. Take a walk. Every minute pick up an object and store it in order. Paint your impressions of the walk. Incorporate the objects on a grid? For this visit a group of us joined tutor Emma Drye to look at “This is it, isn’t it?” An exhibition looking at “self-doubt, self-awareness and self-reflexivity as a core of artistic practice”. The exhibition is curated by MILK, an artist-led collective which aims to support early career and emerging artists in Newcastle and nationally. I’ve always worked on the assumption that the artist gives something – a glimpse of beauty even in the mundane, an idea about how the world could be different, the hint of a shared emotion, an exploration of what colour or line can do. Maybe these artists are giving something, their not very cheerful 20-something thoughts. But why should I listen? I had a discussion with Emma about happiness in art. I had been struck by something Jeremy Deller said in the documentary about his work to commemorate the soldiers who died on the first day of the Battle of the Somme “We’re here because we’re here“. He commented that the theatre people he worked with on the performance were all incredibly can do and upbeat in contrast to all the artists he knew who were all miserable. Emma disagreed with Jeremy and cited Marvin Gaye Chetwind as an artist whose work is “a party” (although she does use actors/performers) and Gillian Ayers as a joyous painter. We also discussed the collective nature of the artists group MILK. The artists don’t collaborate on their art but they work together to put on exhibitions, apply for grants, and share studio space and equipment. Emma suggested that to avoid isolation it was especially important for OCA students to look for opportunities to work collectively. OCA tutor Cheryl Huntbach and curator Yvonne Carmichael took us round the exhibition: “STEAM Ahead” featuring the work of Cheryl as well as artists Fiona Grady and Rachel Barron. Yvonne outlined the work of South Square describing it as a good space for artists to try things out. The centre is used by a mixture of groups including an antiquarian society and it is also a community centre so the audience for exhibitions is very varied. It was great to be able to talk to Cheryl about her work. She made a series of drawings – done by spending 7 minutes a day drawing – from her window of the same branch. This then led to a series of images created with a 3-D pen which were hung in the gallery. It was interesting to learn about the importance of process in her work and setting up a system with boundaries. We followed the tour with a drawing workshop which consisted of a series of 7 minute drawings of a still life. We used sticks and ink which pushed us to be more expressive and less precise in our work. As we looked at the same part of the still life each time it let us get to know the forms and I found myself concentrating more on the negative space and simplifying in the later drawings. I found it useful to draw the same thing repeatedly which helped me get to know the subject better.